Contact Du: Find below customer service details of Du, UAE, including phone and email. Besides contact details, the page provides a brief overview of the Dubai-based telecom company and its services. Reach the Du customer service below for queries, complaints or feedback. Du is a Middle East telecommunications company founded in the year 2005. Headquartered at Dubai, UAE, Du initially operated as Emirates Integrated Telecommunications Company. The services currently offered include prepaid/postpaid connections, broadband, homephone and digital TV entertainment. The clients range from homeowners to small and large business organisations. According to the Du website, the company now has more than 6.5 million mobile customers, 555,000 fixed line subscribers, 180,000 home services subscribers and over 70,000 business clients. 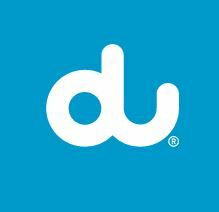 Du’s postpaid and prepaid plans include Emirati Plan, Smart Plan, Pay As You Go and Tourist Plan. You also can pick the latest smartphone or tablet to go with your connection. Brands found include Apple, Samsung and HTC. Under prepaid plans, you have various currencies offering a range of features. You have monthly and daily bundles with non-stop access to apps. To apply for new connection, you can visit nearest store with valid passport or Emirates ID. Looking for data packs? Du customers enjoy a wide range of prepaid roaming and Internet data packs. The data packs start from 160MB to up to 25GB. Other value added services include caller tunes, games club, video store, music store, voice mail and missed call alert. If you are looking for television packages, look no further. Du’s digital TV entertainment comes with 200+ channels in more than 15 languages. You can choose from a variety of premium pay-TV packages. For homeowners, Du offers Homephone fixed line and broadband plans. For tariffs, installation fees, deposits and others, speak to a customer service agent.You can sign up for an account online to view account balance, get usage report, manage services or make a payment. Even prepaid recharges can be done directly on the website. If you would like to visit a nearest store, click here. If you are on the move, download the smartphone app to manage your services and make bill payments in a jiff. I hope you are well and having a good day. Please can you provide me with the work email address of the individual that handles your marketing and events in Dubai? I really cannot tell you how much I would really, really appreciate your help in this.